And others that have been huffed. Even without official government support, the American electorate still favored presidents with superpowers. 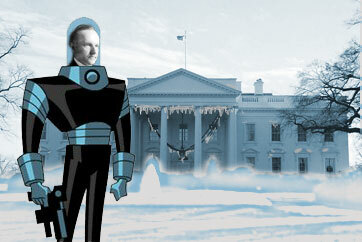 Using the campaign slogan, "Keep Cool with Coolidge," the supervillain Calvin Coolidge promised to provide air conditioning to all 48 states and was relected in 1924. The rest of the decade was known as the Roaring Twenties for the freezing winds that blew across the nation. Coolidge was eventually defeated in 1928 by polar explorer Richard Byrd. To this day, the people of Washington, DC cower in fear at the slightest prediction of snow. This page was last edited on 28 October 2007, at 01:52.